From the first landings at Casablanca straight through to the crossing of the Elbe River and V-E Day, this book tells the gripping story of the European theater of operations battles of World War II that American soldiers, sailors, and airmen took part in and of the strategy behind them. The book's core is its account of such famous and dramatic episodes as the landings in North Africa, Kasserine Pass, Salerno and Anzio, D-day, the liberation of Paris, the Battle of the Bulge, the crossing of the Rhine, and the race across Germany. It also tells the story of the conflicts between American and other Allied leaders over how to pursue the war, and of convoys, U-boat wolf packs, the aerial war over Germany, the bombing of Dresden, and the final surrender of the Nazis. 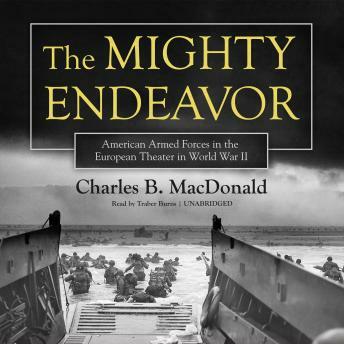 MacDonald takes the listener back to the build-up to war, looking at the circumstances of the American decision during the early 1930s to concentrate, if war should come, on victory in Europe first; and he describes in detail the ways that America forged a disciplined fighting force when war broke out. MacDonald's portrayal of major military figures-George S. Patton Jr., Mark W. Clark, J. Lawton Collins, among others-is both fair and penetrating, and he pays particular attention to other leaders whose accomplishments are not as well known. His sources include official US Army records and direct interviews with noncommissioned officers, privates, and top-level participants such as Generals Eisenhower and Bradley. His account also reflects intensive work with original documents and with many newly available sources, as well as his own experiences in the war as the commander of an infantry rifle company. The Mighty Endeavor is a thoroughly researched history.